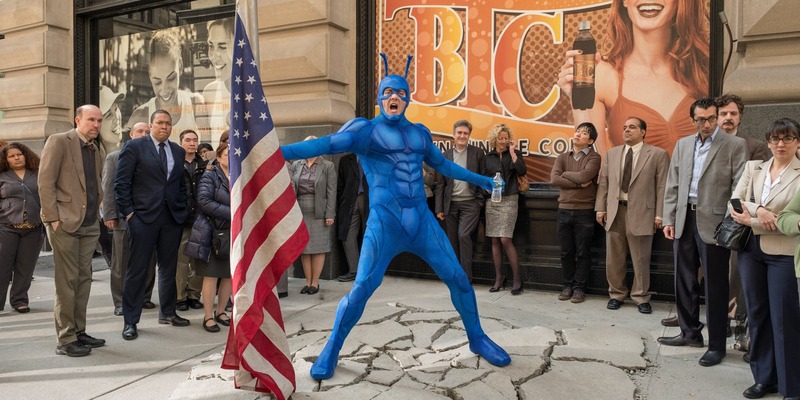 It’s yet another iteration of The Tick, complete with classic ’60s television sensibilities, writes ANDREW JOHNSTONE. “I’ll be defending the defenceless in the area,” says Tick, introducing himself to Arthur’s sister Dot in tones reminiscent of Batman circa 1966. Adam West’s Batman was a language artisan whose warm tones could spin a mundane phrase on the head of a pin and turn it into something pleasurable. Yes indeed chums, it’s The Tick, and this incarnation might just be a nicely pitched tribute to that late and super awesome voice and character. The Tick has no idea where he came from and how he got his powers. He is vague: think The Big Lebowski but as indestructible defender of the poor, innocent and defenceless… and dressed up as a blue tick! Then there is Arthur. Arthur is one of those gifted eccentric types everyone thinks is crazy. In Tick’s eyes Arthur is misunderstood, a great man who has not yet found his destiny. Doubtful Arthur is destined for sidekickery. The Tick has set his sights on it and is not going to let it go. 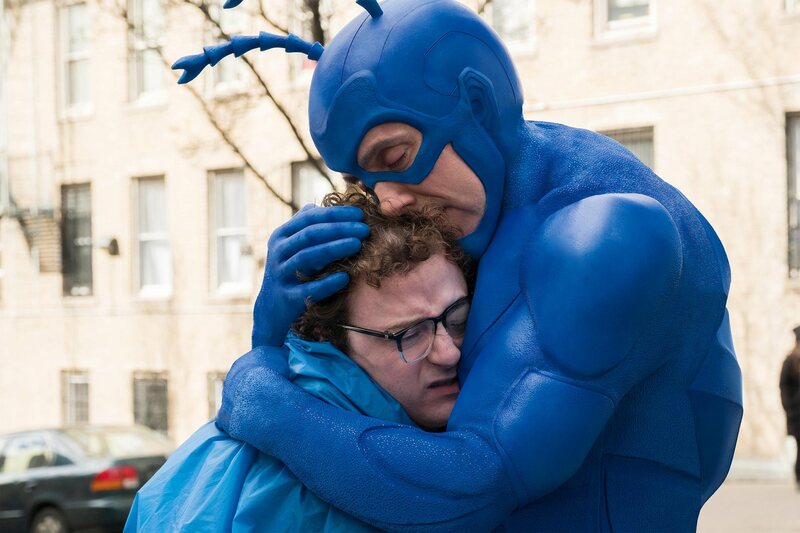 The Tick needs Arthur’s memory and nous and the wounded Arthur needs The Tick’s generously proferred encouragement. Also, they both need a friend. Creator Ben Edlund has honed The Tick through three previous incarnations: the 1986 comic book series, the 1994 animated TV series and the 2001 live action TV series. He has a formula and The Tick 2016 is more or less to type. But how good is this Tick in comparison with those that came before? I encountered Tick 2001 on hot summer afternoons back when viewers were still enslaved to network TV. I got home from somewhere and switched on the telly and there it was. It took me a few minutes to figure it all and by the time the episode was done I was having a thoroughly good time. I was especially charmed by Patrick Warburton’s idiosyncratic delivery and wonderful way with ‘vague’. His Tick was endearing and laugh-out-loud funny. Tick 2016 is played by British actor Peter Serfinowicz, and picks up where Warburton left off. He ups the ante on Adam West and throws in a bit of the animated version’s edginess. The result is a Tick who is earnest, funny and not a little enigmatic. As with the animated version, Serfinowicz’s Tick has qualities, but Warburton’s shadow is a long one. As it stands, 2001 is ahead on points, but not by much. Special mention goes to Townsend Putman Coleman 111, the animated Tick. His Tick is a triumph of comedic voice artistry, and check out Monkee Mickey Dolenz as Arthur. He’s good, but then anyone who has ever heard ‘I’m A Believer’ will know that. As for the 2001 Arthur, he was a sharp-witted and savvy sort of character who had none of the vulnerabilities that make animated Arthur and Arthur 2017 (Griffin Newman) so compelling. Macho men they are not, heroes they are, the proper sort, those who rise to the occasion when adversity challenges. Not that Arthur 2001 wasn’t that as well. He was, just differently. The supporting cast includes Superian (think classic Superman), Overkill (think Dirty Harry or Bryan Mills) and the evildoer of the piece, The Terror (think Donald Trump). This Terror is not as interesting as the circa 2001 model and of the small cast of villains comes in third. In second place is the odious Ramses 1V. Chief of a gang of villains named for his Ancient Egyptian affectations, he is a character drawn straight from ‘60s Batman (aka King Tut – Batman ‘66-‘68). Broadway star Michael Cerveris pitches that ball with splendid ease, but the winner on the day is Yara Martinez as Mrs Lint. One-eyed Lint, think Kill Bill’s Elle Driver if she had forgotten how to be evil. She has work to do on that and as for the false eye, it draws the same kind of fascinated response as the mole on the face of the Mole in Austin Powers – Goldmember. Indifferent to the irony that stalks her, she glowers across the screen, running up a seam of comedy gold. Overkill has got a thing for her. “Did she mention me?” he asks the Tick, not a little anxiously. “Why would she mention you?” offers the baffled Tick. Overkill is not a superhero; he is a vigilante whose sidekick is an artificially intelligent boat, a digital fishwife with impressive tech skills. On the subject of romance, there seems to be a spark between Tick and Dot. It’s that odd way they look at each other that’s giving it away. As for Dot, she’s looking for purpose and is wondering if Arthur and Tick might be that meaningful something she’s been looking for. With Saul Bass-influenced titles, big brassy theme music and snappy dialogue, Amazon’s The Tick references a particular style of 1960s TV. Think Batman, Get Smart, The Monkees, Bewitched and I Dream Of Jeanie. As for the comedic sensibility, it’s an anarchic kind of American absurdism. Think the Marx Brothers, Father Ted, Portlandia, BoJack Horseman and SpongeBob SquarePants. 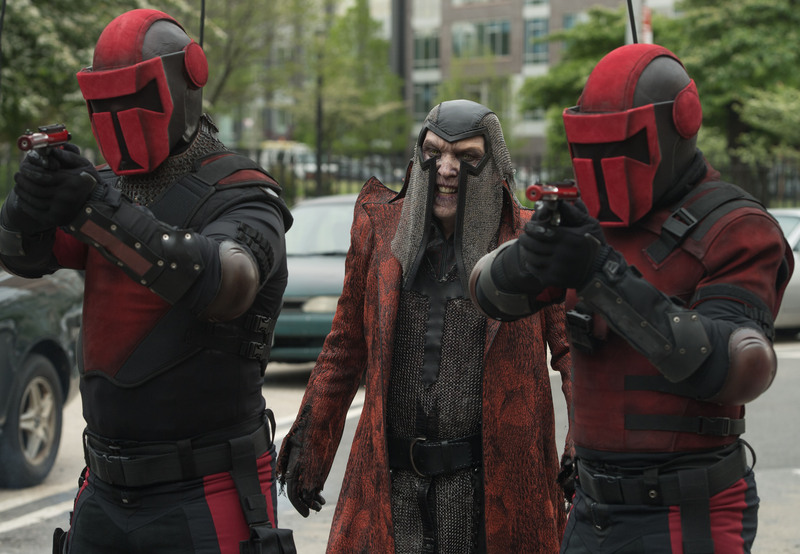 The first live action Tick ran for an inadequate nine episodes. This time around Amazon has made 12 with no word of anymore at the time of writing. I hope it endures. The adventures of Tick and Arthur is an effervescent tonic with an important message – good conscience is a virtue to be admired. * The Tick is streaming on Amazon Prime.